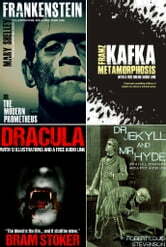 Red Skull Publishing has put together a bumper pack of four iconic horror novels for a very low price. Frankenstein: With 10 Illustrations and a Free Audio Link. Dracula: With 12 Illustrations and a Free Audio Link. Dr. Jekyll and Mr. Hyde: With 13 Illustrations and a Free Audio Link. Metamorphosis: With 10 Illustrations and a Free Audio Link. * 1291 pages long (in the kobo format) for a very low price. * 45 photos and illustrations. * A web link to a free Audio File for each book. (The audio link only works on the Kobo’s Android and iOS apps). * An active (easy to use) Table of Contents listing every book, and chapter accessible from the kobo menu. * Plus About the Authors Section for each book. Mary Shelley's Frankenstein is one of the most iconic works of gothic horror and science fiction literature of all time. Mary started writing the story when she was only nineteen – conceived from a nightmare about a creature produced by an unorthodox scientific experiment. It was published when she was twenty-one. Her monstrous, dark creation has terrified and chilled readers since its first publication in 1818. Bram Stoker’s Dracula is the original vampire story. It is an intense horror, filled with evil and death, as well as seduction and desire. The story follows Jonathon Harker as he travels to Transylvania in Eastern Europe to do business with a mysterious man – Count Dracula. On his way to the count's castle, he is warned by numerous people – even provided with crucifixes, and he is almost attacked by wolves. To his surprise, upon reaching the castle, Harker finds the Count a professional and gentle man – that is up until he realizes he has been made the count's prisoner. While he is under serious threat in the castle, strange things happen elsewhere – a Russian ship is wrecked, and a woman is found with bite-marks on her neck. The great power and ambition of the count manifests itself in deaths and ominous evils, causing a group, including the escaped Harker, to hunt Dracula down with plans to kill him. Dr Jekyll has discovered the ultimate drug – a chemical that can turn him into something else – something sinister. Suddenly, he has the ability to set free his deepest cruelest inner demons in the appearance of the ominous Hyde, which he can bring forth at will. While transformed into his monstrous alter-ego, he starts to roam the streets of fog-bound London. He believes he controls his own fate. First published in 1915, it is classed by many scholars as one of the most influential works of the 20th century, and is studied in colleges and universities across the western world. The story begins with a travelling salesman, Gregor Samsa, waking to find himself transformed into an insect. The first line reads: "When Gregor Samsa woke up one morning from unsettling dreams, he found himself changed in his bed into a monstrous vermin." He becomes an object of disgrace to his family, and is alienated in his own home. It is a harrowing, though absurdly comic study of human feelings, guilt, inadequacy, and isolation. The story describes unexplained horror and nightmarish transformation, with startling details, which has been continually unsettling millions of readers for almost a hundred years. 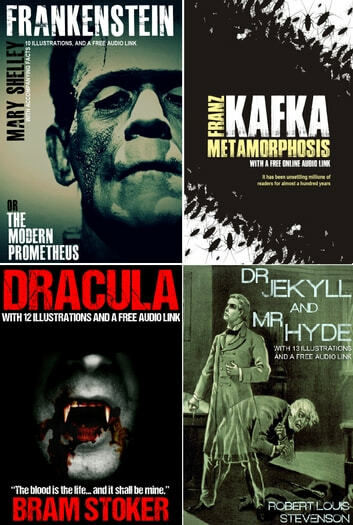 Livres similaires à Frankenstein, Dracula, Dr. Jekyll & Mr. Hyde, and Metamorphosis Bumper Pack, With 45 Illustrations and Free Audio Links.